Have Georgio’s Cater your event and get a very special bonus! New to Event Resources Gig Harbor is my long-time friend Angie Mingus- caterer extraordinaire and owner of Georgio’s Catering. I would like Gig Harbor to embrace and experience the professional service and exquisite food Georgio’s has to offer. You may recall that Georgio’s Opening debut event was at 7 Seas in Gig harbor last October. I blogged about that event and I was so proud to witness the launch of this long-time dream. 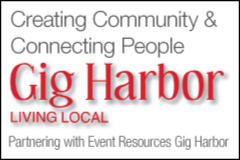 You now will find Georgio’s on Event Resources Gig Harbor under the “Plan your Event” tab. I’m so excited to share this great service with Gig Harbor that I will give you an extra bonus to have Georgio’s cater your next “public” event; If you are the first to book Georgio’s Catering for a public event in the Gig Harbor/ Key Peninsula area I will blog about your event on Betty’s Blog. Yes, I believe in this business so much you are getting my services to promote your event! Just let Angie know you are the first to book and I will followup with you to blog. Georgio’s will de-stress your holiday entertaining.